Just as in any ill-managed household, finances were at the bottom of all squabbles during the SAD-BJP government’s tenure, which also saw a split in the family, at least ostensibly over how to use the kitty. The present fiscal condition of the state may not be of the current government's making alone, but precious little was done to reverse the tendency for populism or maximise the revenue receipts, which is never politically convenient. Pradesh Congress chief’s brother Malvinder Singh today said he was ready to contest from Samana against his nephew Raninder Singh if asked to do so by the SAD. Anticipating a tightrope walk in Gidderbaha due to recent political alignments, PPP chief Manpreet Singh Badal has decided to contest elections from the newly carved out Maur segment in Bathinda district as well. Earlier, he had announced Sukhpal Singh Bhullar, an award winning farmer, as his party candidate from Maur. Various political parties in the state are grappling with dissidence. There are reports that rebels are being encouraged by rival parties. Trouble is brewing in the Congress with those denied the ticket in at least four Amritsar constituencies warning the high command that they may enter the poll fray as Independents. Prominent among them is former Vidhan Sabha Deputy Speaker Prof Darbari Lal, who has been denied the ticket for Amritsar (Central) where the Congress has fielded OP Soni, sitting MLA from Amritsar (West) and a confidant of PCC chief Capt Amarinder Singh. A large number of councillors, former Zila Parishad and Block Samiti members and sarpanches and panches today rallied behind former minister and three-time MLA Joginder Singh Mann who has been denied the Congress ticket. Former Nurmahal MLA Gurbinder Singh Atwal has revolted against the official Congress nominee from Nakodar, Amarjit Samra, announcing that he will contest as an Independent. The SAD rebel, Harsukhminder Singh Badal, has withdrawn in favour of party candidate from Mohali Balwant Singh Ramoowlia but trouble for Congress candidate Balbir Singh Sidhu is far from over. Bordering Tarn Taran, this constituency is set to witness a direct contest between the ruling SAD and the Congress. Sitting Congress MLA Naresh Kataria wrested this seat from the SAD in 2007 after more than 35 years, defeating Hari Singh Zira by 12,372 votes. This border seat, traditionally an Akali stronghold, is set for a keen contest between old rivals SAD and Congress. In the last four assembly elections, the SAD has won but by small margins. While the SAD has fielded Amarpal Singh Bony, Harpartap Singh Ajnala is the Congress candidate. Qadian: The story of Fatehjung Bajwa, brother of Gurdaspur MP Partap Bajwa, seems to be a straight lift from a Bollywood suspense thriller. 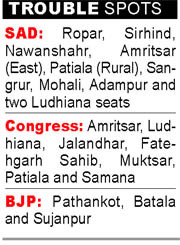 Fateh was seeking the party ticket from either Qadian, his home turf, or Gurdaspur Vidhan Sabha seat. However, ever since he has been denied the nomination, which has been given to his sister-in-law Charanjit Kaur from Qadian, the whereabouts of the Bajwa Junior, who has turned incommunicado, remain in the realm of speculation. A day after Chief Election Commissioner SY Quraishi issued directions to cover the dozen-odd statues of Uttar Pradesh Chief Minister Mayawati and hundreds of stone elephants in Lucknow and Noida during the assembly elections, the statue of a former Akali minister in Patiala has come under a scanner. Unfazed by the decision of his uncle Malvinder Singh to join the Shiromani Akali Dal (SAD), Congress candidate from Samana Raninder Singh Tikku today said the Akali Dal is heading for a defeat in Samana. Former Punjab Pradesh Congress Committee President Shamsher Singh Dullo today inaugurated the election offices of his wife, who is Congress candidate from Bassi Pathana (Reserved) constituency, Harbans Kaur Dullo at Khamano, Kheri Nodh Singh and Bassi Pathana. From the coming academic session, Northern India Institute of Fashion Technology (NIIFT) will be offering degree courses and not the diplomas. Three centres of the NIIFT -- Mohali, Ludhiana and Jalandhar -- will be affiliated to the Punjab Technical University (PTU) for awarding degrees in various fashion courses. With different Sikh groups sticking to their respective stands, the community continues to remain divided over the Nanakshahi calendar which was amended a couple of years ago. Irked over the delay in release of payments for the mid-day meal schemes, many government schools in the district have closed the scheme, while others are on the verge of closing the scheme due to shortage of funds. Four unidentified armed robbers in an Innova vehicle looted cash worth Rs 73,775 from three petrol pumps on the national highway in Phagwara and Phillaur on Friday night. In the first incident, the armed robbers took away Rs 30,000 at pistol point from the employees of a petrol station near Chachoki village on the highway between Phagwara and Goraya. The Punjab and Haryana High Court has made it clear that it is the district administration’s “bounden duty” to ensure compliance of judicial directions on the use of loudspeakers. In a significant judgment, the Punjab and Haryana High Court has made it clear that a father cannot be proceeded against for abducting his own child. 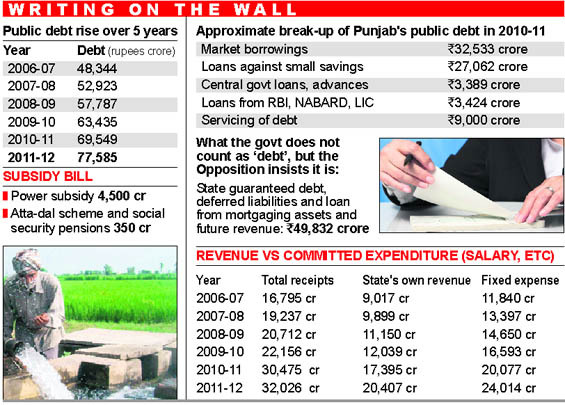 Burgeoning debt burden, a huge salary and pension bill, poor inflow of investment, and lacunae in tax collection, accompanied by evasion, played havoc with the once robust economy of Punjab. The populist agenda adopted by the ruling alliance to keep the voter in good humour did nothing to help the situation. Even as the state's debt soared, the government insisted on not curtailing any populist scheme, whether it was power subsidy to the farm sector, subsidised flour and pulses for the poor, or various pensions for marginalised sections of society. In fact, announcement of benefits for various categories continued till just days before the elections to the state Assembly were announced. Chief Minister Parkash Singh Badal announced increase in the pay grades of a section of employees, 200 units of free power for economically weak and socially backward families, and a rehabilitation package for units in the Goindwal Industrial Complex. The sops announced in just the past two months would increase the state's liability by Rs 1,500 crore per annum. For 2011-12, the subsidy bill of the government is expected to cross Rs 5,500 crore. Former vice-chancellor of Punjabi University S.S. Johl says it is the populist policies of successive governments that have played havoc with the economy of Punjab. “There have been unidentified expenditures on subsidies and grants handed out at sangat darshan programmes. There have also been unprecedented salary and pension increases. And the excesses have been financed by borrowings,” he says, adding that the only way to revive Punjab's economy is to ensure that any government in future spends every rupee only according to the state's Plan, which, in turn, should be in accordance with the resources. No amount of counsel from experts was able to persuade the SAD-BJP government to acknowledge the fiscal mess the state is in. The only voice of dissent on the issue within the government — former finance minister and now People's Party of Punjab president Manpreet Singh Badal — was silenced for his public outbursts on poor fiscal health and dissent on subsidies. The differences led to his estrangement from the government as well as the SAD, and spurred him to create his own political outfit. Even today, the political leadership is not ready to accept the state's finances are in a mess. Time and again, Badal has claimed the real reason for the huge debt burden is non-cooperation of the Central government in bailing out the state by giving it a debt waiver. He also wants a tax incentive scheme for attracting industrial investment on the lines of the concessions available to the neighbouring Himachal Pradesh. Punjab has also been demanding its share in the Central taxes collected in the state be increased from the present 30.5 per cent to 50 per cent. As of today, the state's economy is in a shambles. In the past five years, the debt burden increased from 48,344 crore to a whopping Rs 77,585 crore (by the end of this fiscal). The cost of servicing this debt, too, increased manifold. Punjab has already reached a debt-GSDP (gross state domestic product) ratio of 39 per cent, for which the limit has been set at 40 per cent set by the Planning Commission. In the past year alone, the government borrowings have gone up by over Rs 1,900 crore, as this financial year the net borrowings will be around Rs 8,037 crore. Since even the state's committed expenses are more than its own tax revenues, the government has been borrowing liberally through state development loans, from small savings contributions, besides taking loans from the RBI, NABARD and LIC. These borrowings continue to increase year after year, as there has been no definite roadmap for revenue growth. The state has also been giving sovereign guarantees for borrowings through its various boards and corporations, most of which are already in the red and will never be able to repay the loans. The liability for repaying this debt falls directly on the government. In order to raise some funds for developing infrastructure, the government also revived the Optimum Utilisation of Vacant Government Land Scheme (OUVGLS) to sell vacant government land in prime locations in major cities and towns. The only saving grace in the Finance Department was the surge in tax collections, especially towards the end of the government's tenure. In the last financial year (2010-11), the total collections in Punjab saw a remarkable jump of 44 per cent, mainly on account of higher VAT and excise collections, stamp duty and registration charges. This year the government is expecting the tax collections will go up by another 17 per cent. But this may still be insufficient to foot the total salary and pension bill of the state, especially with an additional Rs 10,000 crore expense being added on account of pay hike and arrears to employees in keeping with the Fifth Pay Commission recommendations. As against the state's own tax revenue of Rs 20,407 crore, the committed expenditure alone is Rs 24,014 crore. Sucha Singh Gill, director of the Centre for Research in Rural and Industrial Development, says during the past five years, the state faltered on account of resource mobilisation, especially in Central government schemes, such as the Jawaharlal Nehru National Urban Renewal Mission. Many opportunities to get funds under that and other Central schemes were lost for want of the state's own contribution or lack of effort to prepare proposals. “The tax to GSDP ratio in Punjab has remained 8-8.5 per cent during the past few years. 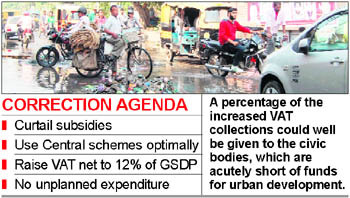 The way forward would be to increase this to 12 per cent through ushering in urban reforms. Since VAT collections have remained buoyant, 10 per cent of these collections should be given to urban local bodies in order to make them self-sufficient. The state has also gone beyond the planned expenditure, with sops being doled out at public meetings and sangat darshans, besides infrastructure development. The government should stop relying on populism, get realistic and reintroduce octroi, which can be used for development as well as debt retirement. All resources generated should be spent in a planned manner, and no populist unplanned expenditure should be added,” he says. Malvinder, who visited Samana today, said he had not asked the SAD for the party ticket. “In fact, Badal Sahab (CM Parkash Singh Badal) offered me two seats, but I did not accept the offer”. He was now open to contesting from Samana if the SAD offered him the ticket, he said. A rather bitter Malvinder said he had decided so because his nephew Raninder had not kept the ‘rehat maryada’ and his sister-in-law had effectively blocked the party ticket to him from the Patiala parliamentary constituency. Malvinder maintained he held a special place in the hearts of the common man and the people of Samana. “I managed the affairs in Samana for five years when my brother (Capt Amarinder Singh) was Chief Minister and can confidently say that I did not allow any injustice to take place. I am respected because of this”, he claimed, adding his flock was waiting for his “hukum”. Getting into the battle mode, Malvinder has decided to target Preneet Kaur’s prime supporters. He said his first priority would be to ensure the defeat of Congress candidate from Rajpura Hardyal Singh Kamboj, who was primarily responsible for resisting his candidature from Patiala Rural or Samana. 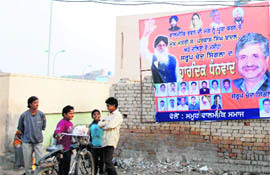 Kamboj, a Preneet confidant, has a rural base in Patiala district. Malvinder has only good things to say about his brother, who supported his candidature. Patiala: Putting an end to all speculations about the possibility of contesting the elections from Samana, Malvinder Singh today canvassed for former MLA and SAD Samana candidate Surjit Singh Rakhra urging the electorate to vote for the SAD. Keeping his words of not speaking anything against his brother at any platform, Malvinder did not utter anything against Capt Amarinder Singh. Malvinder, who drove in his personal car from Patiala, was accompanied by Rakhra, who sat besides him and both were seen arriving and going back together from the two venues where they had addressed supporters in Samana. However, today’s happenings ended the speculations of a triangular contest between the scions of the royal family and Rakhra. Anticipating a tightrope walk in Gidderbaha due to recent political alignments, PPP chief Manpreet Singh Badal has decided to contest elections from the newly carved out Maur segment in Bathinda district as well. Earlier, he had announced Sukhpal Singh Bhullar, an award winning farmer, as his party candidate from Maur. Manpreet said he would file his papers from both the constituencies tomorrow. He said he would not take a convoy of vehicles at the time of filing the nomination. “Only some family members and a few legal experts will go to the office of the returning officer,” he said, adding, “I have told my supporters to keep it a simple affair and not to create problems for people in the urban areas”. His decision to contest the election from Maur as well indicates that he is trying to play safe following a revolt in the Congress whose dominant section has announced to support the ruling SAD. He said the decision should not be seen as his weakness but he had to do so because “the SAD and the Congress will adopt all sorts of tactics to defeat me. My victory would mean the political end of the SAD”. Meanwhile, Chief Minister Parkash Singh Badal will file his nomination papers on January 10. However, Deputy Chief Minister Sukhbir Singh will file his nomination papers tomorrow. While the Shiromani Akali Dal (SAD) accuses the Congress of allotting ticket for reasons other than merit, the Congress is accusing the SAD of backing its rebels with money and promises of a bright future. A senior SAD leader is believed to be monitoring dissidence in the Congress and SAD president Sukhbir Singh Badal has been quoted saying that “the Congress is facing dissidence on 38 seats which is expected to touch 50 by the time nominations come to a close”. The Congress, which took no note of signs of dissensions, suffered a jolt with Capt Amarinder Singh’s brother Malwinder joining the SAD and announcing that he will campaign against Congress nominees. Bharatiya Janata Party (BJP) leaders are considered more disciplined than those of other parties. But the party is seeing a virtual revolt in the Majha region with dissidents threatening to oppose the party nominees on the Pathankot, Batala and Sujanpur seats. There are reports of many disappointed ticket aspirants making a beeline for the homes of leaders to get their commitment on being adjusted on boards and corporations after the government is formed. At the same time, party leaders are trying to cajole the rebels by promising them Rajya Sabha nominations, money, jobs for kin and concessions like a red beacon and official car. The SAD is facing dissidence in Ropar, Sirhind, Nawanshahr, Amritsar (East), Patiala (Rural), Sangrur, Mohali, Adampur and on two Ludhiana seats. The Congress is having a tough time placating former MLAs, MPs, ministers and senior leaders in Amritsar, Ludhiana, Jalandhar, Fatehgarh Sahib, Muktsar, Patiala and Samana. Leaders like Malwinder Singh, Gurkanwal Kaur, Darbari Lal, Hans Raj Josan, Parkash Bhatti, Sucha Singh Chhotepur, GS Atwal and Deepinder Dhillon have indicated that they will oppose the official candidates. Prof Darbari Lal met his supporters at Katra Sher Singh here today. “I will wait for the high command’s response till January 11 after which I will enter the fray as an Independent,” he said. Prof Darbari Lal had lost the seat in the last elections to Punjab Social Welfare Minister Laxmi Kanta Chawla by over 3,500 votes. The Congress is also facing trouble in the Majitha constituency which does not augur well for the party with Youth Akali Dal chief Bikram Singh Majithia in the fray from there. The Congress has fielded greenhorn Shailenderjit Singh Shelly, who belongs to Rahul Gandhi’s youth brigade, a move which has not gone down well with former DCC (rural) president Sukhjinder Raj Singh (Lalli) Majithia, who was defeated by Bikram Singh Majithia in 2007. Lalli met his supporters at Chawinda today. “I will file my nominations as an Independent on January 11 if the party sticks to its decision,” he warned. 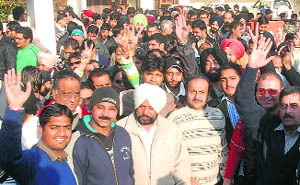 In Amritsar (North), Congress leader Karamjit Singh Rintu held a meeting with his supporters. He too asked the high command to reconsider its decision by January 11, failing which he would contest as an Independent. In Amritsar (South), Congress leaders Harjinder Singh Thekedar and Navdeep Singh Goldy have joined hands against official nominee Jasbir Singh Dimpa. His supporters formed a 11-member action committee to chalk out the next course of action. Addressing a mammoth gathering of supporters here today, Mann alleged that a person responsible for disturbing the town’s peace and dividing people on communal lines had been allotted the ticket. Amidst slogans of “Congress ki majboori hai, Mann Sahib zaroori hai”, Mann said he had always stood with the party workers and townsmen, even during the troubled days of militancy. He said he would abide by the decision taken by the 11-member committee. Among those who spoke in his favour were former block Congress president and former councilor Manmohan Sharma, former councilor Sanjeev Bugga, former president of the District Youth Congress Jagjit Singh Bittu, former president of the Block Youth Congress Inderjeet Singh, president of the local Youth Congress Gaganjit Soni, councillors Rampal Uppal, Pramod Joshi and Jitender Varmani, former local YC chief Rajan Sharma, former District Mahila Congress chief Sanjeewan Lata, former Chairman of the Block Samiti Jeet Ram, former Block Samiti members Vijay Lakhshmi and Hukam Singh Mehtaan and former president of the human rights cell Daljeet Singh Raju. 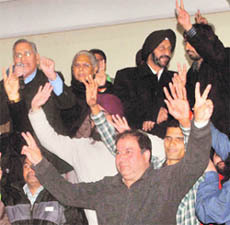 These leaders said by denying the ticket to Mann, the Congress had given the seat to the SAD-BJP alliance on a platter. Mann alone could win the seat for the party, they emphasised. Meanwhile, the SAD move to field hockey star Pargat Singh has created rumblings within the party. More than 1,000 supporters of SGPC member Paramjit Singh Raipur met here today and criticised the leadership for ignoring Raipur who unsuccessfully contested the seat in 2002 as the SAD candidate. Raipur had in 2007 supported the then SAD candidate Jagbir Brar after he was promised that he would be “adjusted’ as chairman of a board. Raipur said ignoring “sincere and hardworking” workers would only harm the party. Pargat Singh was not available for comment. The late Beant Singh’s daughter Gurkanwal Kaur, who had won the constituency in 2002 as the Congress candidate, may put up her son Amandip from the constituency as an Independent, say sources. Gurvinder Atwal who won the Nurmahal seat on the Congress ticket in 1992 and 2002 and was an aspirant from Nakodar will file his papers as an Independent on January 12. Former OSD to former CM Capt Amarinder Singh today revolted against the party decision to allot the ticket to Sidhu, ignoring her candidature. Addressing party workers and supporters in Mohali today, Lakhwinder Kaur Garcha hinted at contesting the coming elections as an Independent. She accused the party of neglecting old party workers. “I will take the final decision on January 11”, she said. She charged the sitting MLA with distributing liquor and drugs and encroaching prime land. This win was attributed to Kataria's personal touch with the local people. This time too the SAD has fielded Hari Singh against Kataria. The latter managed to get the party ticket despite strong lobbying against him. Projects: All villages in the Zira constituency, including the towns of Zira and Makhu, fall in the Sutlej basin. A sugar mill was set up by the Cooperative Department at Zira about 30 years back, but sans much success. There are a total of 1,53,624 voters in this constituency, (women 73,368 and men 80,256). The Jat Sikhs comprise more than 60 per cent of the population, Dalits 26 per cent, Hindus 12 per cent and other communities 2 per cent. VOX POPULI: The major demand of the people is a concrete flood protection policy with farmers in villages adjoining the Sutlej often facing the wrath of the river in the monsoons. Residents in Zira and Makhu towns want better amenities. Healthcare has been in a shambles and no professional institute has come up in the area. 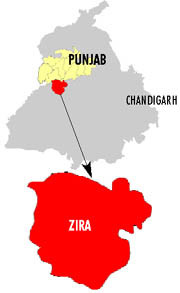 There is resentment among the people for merging the Zira assembly segment with the Khadoor Sahib Lok Sabha constituency. No effort has ever been made by successive governments to establish educational institutes and industry in this constituency. LOOKING BACK: Hari Singh Zira has represented this constituency three times in the past 35 years. He first won the election in 1977, defeating Nasib Singh Gill of the Congress but was denied the ticket in 1980. Post-delimitation, a number of villages dominated by Rai Sikhs have been shifted to the Rajasansi constituency while at least 22 Jat-dominated villages, all Congress strongholds, have been attached with this border constituency. Rai Sikhs were considered SAD supporters. However, the denial of ticket to its representatives during the SGPC elections has estranged them. Sitting MLA Bony has been trying to woo back the disgruntled Rai Sikhs as well as Congress supporters from the newly added villages, who can play a major role in the outcome of the elections. Projects: Bony is seeking votes in the name of development works initiated in the area such as the laying of sewerage lines and construction of bus stand at Ram Dass. However, the people are unimpressed as the projects are far from complete. He also claims to have upgraded various government schools, opened Jawahar Navodya School, to have spent Rs 200 crore on various works, including new roads in villages. VOX POPULI: Bony’s rivals point out that a majority of works were initiated during the Congress rule with the help of Central funds. They say the MLA brought no major project to benefit the youth. The residents say that health and industry has remained ignored by consecutives governments. The lone sugar mill, a source of employment, has mostly remained closed. The Sugar industry is dying because of the wrong policies of the government and no MLA ever took the initiative to revive the mill, they allege. The Returning Officer has asked the authorities concerned to either get the statue removed or cover it, citing violation of the election code of conduct. However, Surjit Singh Kohli said that the statue was passed by the MC a year ago and a private society had installed it. "We have nothing to do," he clarified. 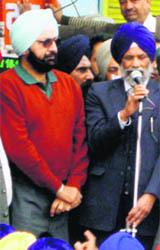 Following a complaint to the Election Commission against SAD's Patiala candidate Surjit Singh Kohli by his own party colleague from the city, that Kohli had installed the statue of his late father and former Akali minister Sardara Singh Kohli installed near Anardana Chowk, the Election Observer for Patiala has asked the Returning Officer to look into the complaint. A complaint in this regard was forwarded to the EC by SAD councillor from Patiala Sohan Lal Jalota, who alleged violation of the election code of conduct. He said Surjit Singh Kohli's son is Patiala Mayor and the statue was installed on January 5, 2012. "Though I am a SAD councillor but rules should be followed by all and this is total violation of rules and wastage of public money to the tune of lakhs of rupees," he said in the complaint. 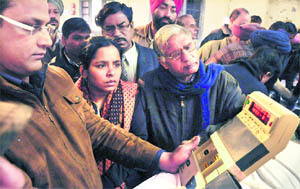 Patiala Election Observer SK Meena said that the complaint had been forwarded to the Returning Officer. "The RO is in a better position to act against such violations. We can act after the nomination is filed and the expenditures are declared by the candidate", he said. Returning Officer Anil Garg confirmed that he had received the complaint and had asked the Joint Commissioner, Municipal Corporation, Patiala, to take suitable action. "Either the statue should be covered or it should be removed if it was installed after model code of conduct came into force", he said. Without commenting on Malvinder, Raninder said that considering the 'good performance' of the Congress, he has been receiving support from various quarters of the constituency. "The Congress certainly has an edge, on account of the poor performance of the SAD-BJP alliance government, but still I am fully prepared for the electoral battle in Samana", he said, while adding that "Ladai de akhare wich, takkar barabar di hundi hai" (I take it this way that in a poll battle, it would be an evenly poised battle). Speaking to mediapersons, Raninder said that he would open two election offices in Samana on Monday and an aggressive election campaign would be started in the entire constituency. Raninder further said that to chalk out the strategy for the impressive election campaign, he has convened a meeting with the Congress leaders of all the villages of his constituency, today. Refuting charges of his opponents that he was new to the constituency, Raninder said, "My family has nurtured the constituency from more than past two decades. My father Capt Amarinder Singh was an MLA in 1992 from Samana. My mother Preneet Kaur is representing Patiala Parliamentary Constituency since 1999." Asked about the Dera Sacha Sauda followers vote in his constituency, he said that being the nominee of a secular party, he has appealed to all the deras and sects to vote for the Congress for the overall development of the state. "There is complete 'gundaraaj' in Punjab with Badal's unleashing reign of terror against the Congress workers and leaders. I am sure, the people of the Punjab would teach Akali's a lesson by voting the SAD-BJP alliance out of power in the elections", he said, while adding that the Congress would register victory in the elections with a comfortable margin. On the defection of Malwinder Singh, brother of Capt Amrinder Singh, from the Congress to the SAD, he said it would not affect the prospects of the Congress in state. He stressed that political parties should discourage defection by not taking the defectors into their party. He said the trend of defection would ruin the political system and the politics would become a trade. He said, "That's why Anna Hajare movement got the support of the people, as they are fed up with politicians." About dissidence in the Congress after announcement of candidates in the state, he said, "There are 117 seats and 2,500 had applied for the tickets so the rebellion is natural." He said that the dust would settle down soon. Earlier, addressing the party workers he called upon them to work to strengthen the party. Citing his own example, he said he had applied for the ticket and was member of the committee, but the party did not allot him the ticket. "It does not mean that I should resign from party and contest elections," he said. The degrees would be awarded not only to the students aspiring to take admission in various courses of the NIIFT being run by the Punjab Industries Department, but also the students who had earlier completed their diploma courses from these institutes, after attending a one-year bridge course. Officials said that a team of experts from the Punjab Technical University had already conducted inspection of the centres at Mohali and Ludhiana to check whether infrastructure was in place for converting the centres into degree colleges. "We are also upgrading the three centres. A new building has been built in Mohali with the state-of-art equipment at an estimated cost of Rs 21 crore. A new building for the Jalandhar centre, too, is being constructed at an estimated cost of Rs 25 crore. 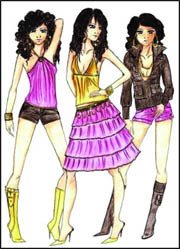 The course curriculum has also been revised and is in consonance with the curriculum offered at the National Institute of Fashion Design (NIFD) centres," said SS Channy, Principal Secretary, Industries, Punjab government. The three NIIFT centres have been awarding undergraduate and post-graduate diploma courses in fashion and textile design, fashion design knits, design in leather apparel and accessories, garment manufacturing and fashion market management. Though the students of these centres get 100 per cent placement, it was a long-pending demand that the diploma courses be converted into degree courses. Earlier, the Punjab Industries Department had tried to get the affiliation for the NIIFT centres from the National Institute of Design (NIFD). The Board of Governors of NIFD had approved that the NIIFT centre at Mohali be affiliated to the NIFD. But after the board raised the fee for affiliation to Rs 100 crore (from Rs 60 crore earlier), the Punjab Industries Department decided to drop the proposal. While the SGPC-run gurdwaras celebrated the birth anniversary of Guru Gobind Singh on December 31, the DSGMC, led by Paramjit Singh Sarna, and other organisations like the Dal Khalsa went as per the original version of the calendar and celebrated the event today. Interestingly, as per the amended calendar, which is followed by the SGPC, Guru Gobind Singh’s birth anniversary will not be celebrated in 2012. Reason: As per the amended version, the gurpurb was celebrated for the second time in 2011 on December 31 while the birth anniversary does not figure in the calendar this year. On the other hand, the birth anniversary of the 10th Sikh Guru is celebrated on January 5 every year as per the original calendar. Sarna has been strongly opposing the amended calendar right since the changes were made and has maintained that original Nanakshahi calendar is a symbol of a separate Sikh identity. Similarly, the Dal Khalsa vowed to stick to the original version, arguing that the amendments are in sync with Hindu religious events. The organisation voiced its concern against mixing of Nanakshahi (solar calendar) with Bikrami (lunar calendar). Sources in the Education Department said that many schools in Samana block 1 and 2 and Bhadson had written letters to the DEO stating, "They have closed the scheme as they have not received payment worth thousands of rupees and could not shell out any more money from their pockets for the scheme." One of the teachers said, "Almost every school has a pending sum of nearly Rs 40,000 and the total amount in Patiala district alone is over Rs 2 crore. We tried our best to continue the scheme, but finally gave up because of dearth of money. I have already paid Rs 20,000 from my pocket and have not received even a single penny so far. I have to support my family also. How can we continue the scheme while the Education Department is not releasing the money.". Criticising the menu of the mid-day meal, another teacher rued that the department had included expensive items like kheer and vegetables. He said, "We, somehow, managed to afford other food grains with the help of shopkeepers, but milk cannot be bought without making timely payment. Therefore, we have excluded these items from our menu." DEO (Elementary) Balbir Kaur Gill said she had already brought the matter to the notice of senior authorities. "This is not in my hands, as I release the money as soon as it reaches me," she added. The directions by the Bench of Chief Justice Ranjan Gogoi and Justice Mahesh Grover came on a petition against the use of loudspeaker at high pitch after 10 pm. Acting on the petition, the High Court also ordered an inquiry by Patiala Deputy Commissioner into the allegations of indiscriminate use of loudspeaker at a village in Patiala district. Singh Sabha Mata Gujri Ji in Ajrawar village of Rajpura tehsil. The petitioner had contended that the loudspeakers were being “used at a high pitch even after 10 pm”. She had claimed this was causing “disturbance to the petitioner, her family and other residents, besides being contrary to the law laid down by the Apex court with regard to such use”. The Bench also took note of the fact that the petitioner filed representations before the Deputy Commissioner and Patiala Deputy Inspector-General of Police. “But no firm action has been taken by either of the two authorities, leaving the petitioner with no option but to move this court”.The Bench asserted: “The use of loudspeakers at particular volume at different hours stands regulated by court orders, including orders passed by the Apex Court from time to time. “Such directions and orders, which hold the field as on date, would certainly require to be complied with by all concerned, and it is the bounden duty of the district administration to ensure such compliance. “In such circumstances, we close this writ petition by directing the Deputy Commissioner, Patiala, to make/cause to make an inquiry with regard to the allegations made by the petitioner and if the same are found to be substantiated in any manner to issue orders to the concerned defaulters to take corrective action as mandated by law,” the court said. “The Deputy Commissioner will act in the matter without any delay and ensure that necessary orders/directions, as may be warranted in law, are issued at an early date”. The development is significant as the police in this part of the region was registering cases against one of the parents in matrimonial disputes on the allegations of abducting his or her own child. In a first, Justice Ranjit Singh said the father was the natural guardian and could not be dubbed as an abductor of his own progeny. The ruling came on a petition filed by Aman Kumar against the State of Punjab and another respondent. He was seeking directions for quashing an FIR dated May 1, 2010, registered under Sections 363, 365, 506 and 34 of the IPC at the Sadar Police Station in Amritsar city. In the FIR, the petitioner was accused of kidnapping the younger son by his wife from her lawful custody. The petitioner had approached the high court for quashing of the FIR on the ground that being a father, he cannot be accused of abducting his own son. As the case came up for hearing, the petitioner and his wife confirmed that the dispute or differences between them had been resolved and they were now living together happily along with their children. Justice Ranjit Singh ruled: "It is rather good to see that the couple has shown some sense and have decided to reconstruct their marriage by removing their differences. This will be good for young children as well, who need love and affection of both the parents." "Since the parties have decided to stay together, they need to be encouraged. The FIR, which has, otherwise, been lodged against the petitioner, would also not reveal any offence, as the petitioner being natural guardian of the child could not be accused of abducting his own child," the court observed. "The case is made out for quashing the FIR on the ground that no offence is revealed from the allegation made in the FIR and also on the basis of the compromise…. The present petition is allowed. The FIR dated May 1, 2010, and all subsequent proceedings arising there from are hereby quashed," the HC said.